Marcott et al claim of 'unprecedented' warming compared to GISP ice core data | Watts Up With That? Surface temperature reconstructions of the past 1500 years suggest that recent warming is unprecedented in that time. Note that this is just a simple visual comparison, with a rough match of the data for time and temperature scales – it isn’t intended to be anything else. In my overlay above, the Marcott et al graph full time scale on the x axis is 2000 years, and its temperature full scale on the y axis is two degrees C. The scaled overlay to the Alley GISP2 plot is a reasonably close match to the GISP2 plot scale units. The centerlines don’t match, but they can’t with this sort of comparison. The idea here is simply to compare magnitudes of the data on the same time scale. 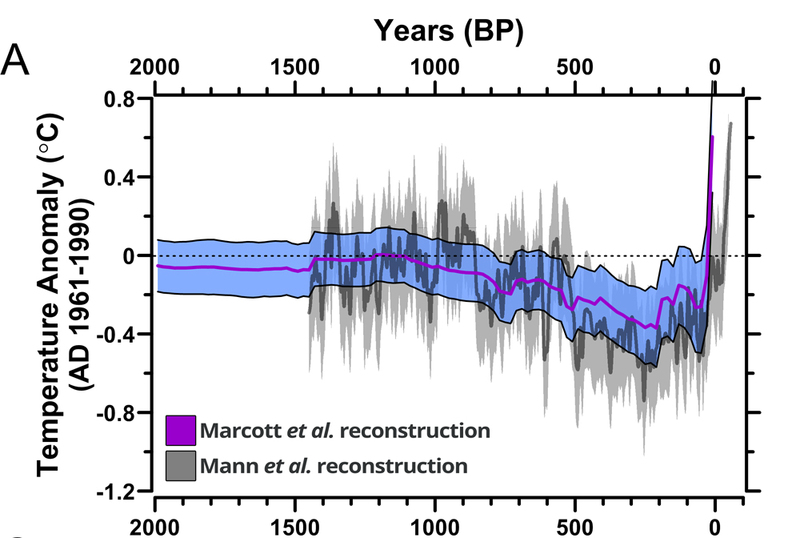 Clearly, the GISP2 data has greater magnitudes in the past 1500 years, and at longer time scales, the GISP2 temperature reconstruction dwarfs the magnitude of the Marcott et al temperature reconstruction. Dr. Don Easterbrook has a good synopsis of GISP 2 temperature reconstruction magnitude on WUWT here. This simple visual comparison suggests that their “unprecedented” claim for the 1500 years BP is unlikely to hold up when examined against other reconstructions. As they say in the big leagues, more study is needed. Our results indicate that global mean temperature for the decade 2000–2009 (34) has not yet exceeded the warmest temperatures of the early Holocene (5000 to 10,000 yr B.P.). These temperatures are, however, warmer than 82% of the Holocene distribution as represented by the Standard5×5 stack, or 72% after making plausible corrections for inherent smoothing of the high frequencies in the stack (6) (Fig. 3). In contrast, the decadal mean global temperature of the early 20th century (1900–1909) was cooler than >95% of the Holocene distribution under both the Standard5×5 and high-frequency corrected scenarios. Perhaps this weekend when I have more time, either I can do a proper plot of the data in a similar fashion to see how well they match when plotted side-by-side in the 1500 year time frame. Unfortunately I have other work to do today, so I can’t at the moment, and I’m traveling again tomorrow. Posting will be light. Every time I see one of these “studies” I think we have finally reached the pinnacle of stupidity, but then there’s another. I think it might be a good idea to look at your “years before present” they look rather out of alignment to me. Nevada County’s local left is promoting the Marcott etal Study, and this is reblogged is to provided for some perspective for the more rational thinkers. Now that the original hockey stick graph (and it author) cannot be ignored as anything other than a joke. We now bring you… the new hockey stick, Hockey stick 2! I’m assuming Marcott et al are still tacking on the thermometer record for 20th/21st century temperatures. If so, then there is still the apples/oranges comparison of thermometer and paleoclimatoligical records, where the statisical methods used to generate the paleo record wash out the short term variations that the thermometer records captures. I also cannot see that the error bars 10K years ago will be the same as 500 years ago. Ooh, look – they’ve got rid of the MWP. Again. Do they really think people will forget if they keep trying that trick? I posted this on the earlier Marcott thread, but it may be more appropriate here. Apologies. I’ve had a quick look at the data, and it seems to be a mixture of different behaviours. One set of five series shows a peak around 9k years ago, a dip from 7k-3k and a rise to the present day. Another set of around thirty five series shows pretty much of nothing. It looks like random noise. And the third set of around twenty series shows the holocene optimum we know, with a peak around 2 C warmer than today. Of course, that might be saying that the Holocene peak did not occur everywhere, and that in many places the temperature didn’t change, which is how they’re interpreting it. You would need to look at the individual data sources to tell. Whether the Holocene Optimum was global or not, it’s definitiely very naughty to splice on the instrumental record and talk about anything being ‘unprecedented’. The proxy data smooths anything going on at less than 300-3000 years (figure S18 in the SI). Apples and oranges. I also noted from their map that most of their sites seemed to be on or near the coast. A maritime climate might not necessarily reflect changes in either ocean or continental climates. This may also be an apples/oranges comparison. IF it is generally true that north-polar temperatures fluctuate more than global averages (as currently appears to be case), then an additional vertical scaling adjustment might need to be applied, even to make a qualitative match, and this would tend to reduce the high temperature fluctuations of the ice core data w.r.t. the global pollen reconstruction. Is there not a comparable global reconstruction over a longer time span that the comparison can be made with? What might be truly unprecedented is if the Holocene DOES NOT have from 1 to 3 strong thermal excursions right at it’s typical 1/2 precession age end. The way temperatures have been “homogenized” in the past 100 years (do I hear a “model” echo? ), they can’t honestly be compared to deterministic temperatures from ice cores. That’s like comparing apples and oranges. So Marcott is right–his bunch of CAGWs only look at models and their models are designed to show that the last 100 years have the largest spike. I’m glad he took the time to tell us. Marcott should have added that caveate to his statement; had he looked at the Ice Core data (which some alledge is smeared by diffusion so it’s undoubtedly less pronounced that reality), such a daring accuasation couldn’t have been made. When is ‘present’? The acronym BP [before present] normally means before 1950 so that the time axis stays fixed. One study compares local temperature response at an acknowledged labile location (Greenland). The other study compares global temperature response. It is a rough match of data measuring 2 different metrics which would be expected to be different. Seth’s article is everywhere, as opposed to the report, which is behind a paywall. So, this comment is informed by the former. They claim that the dramatic turnaround in temperature began about 100 years ago, which inspired two thoughts. The last datapoint of the Alley data is 1855, there’s been some warming since then. GIPS2 is a history from one location with a couple of proxies for temp. It might be a better representation than a Greenland ice core. In fact, it ought to be better. Whether it really is better is the open question. Mann sampled from more than one location, too, but the proxy is very noisy and the sample weighting preposterous. Marcott may have done better, but getting a pay-walled paper in just under the wire for IPCC AR5 does not add to the paper’s credibility. You do know that a number of Greenland ice cores are among the proxies used by Marcott et al, right? Its not that surprising that localized variability (especially in high-latitude areas) would be much higher than in global reconstructions. 1. The Marcott analysis has a time resolution of around a century. in both cases the person who cites higher frequency data to counter lower frequency claims is really OFF TOPIC. and the person points to high temps in new mexico to counter Anthony’s claims about a US average is also OFF topic. In short. you cannot refute a spatial average ( Anthony says the US is 76F) by citing a point measurement ( LA was 92! anthony must be wrong ) and you cannot refute a low frequency measure ( the annual SF temp is 55F) by citing a high frequncy measure ( Sat, sept 5th at 1PM was 81F). Oh and here is another thing to ponder: Imagine the Holocene was warmer than they suggest. That would imply a more sensitive climate since the change in forcing between Holocene and LIA isnt particularly big. I see Michael Mann’s “endorsements” peppered all over some of the breathless news accounts of the study. That alone should raise suspicions. Scale and time are so important. Perhaps this needs labeling “Your so called hockey stick is here”? What is actually stunning is only a 3 degree fluctuation over 10k years. So I would say that as soon as man arrived in numbers, everything got fixed, so everyone, pat yourselves on the back. If Man and CO2 were involved, they were the fix, not the cause. It is also very obvious that civilization on earth is much more at risk of freezing to death. Perhaps Marcott et al confused the temperature data from their rectal thermometer and mixed the signals during an illness and drug induced deluded analysis? It seems likely that their intellectual grasp of reality is rather lacking and this would be a plausible mistake. Thanks for doing the heavy lifting NiV. The modern anomaly is more likely due to the low resolution and dating uncertainty in the proxy data than unprecedented warming. There’s a reason why we don’t correlate well logs based on radiometric dating or even on paleontology. We correlate them based on log characteristics (kind of like wiggle matching). That’s a common criticism of Easterbrook graphics (which these appear to be; they’re not from Alley’s 2000 QSR article — although that’s somewhat implied). The first datapoint appears to be 95 BP, which is 1845 — “hiding the rise” during the past 150 years. Is this correct? If so, there should a large note in the article text. Also, it would be nice to have a citation (or link) to the source of these graphics. “The resolution of the reconstruction is averaged into 100-year segments, which means yearly or every-decade variability fails to show up in the new study. There could have been a period sometime in the past 11,000 years that was warmer than today, but if so it wasn’t sustained for at least 100 years. What do climate model projections have to do with it? Does their new and improved hockey stick include model projections? Ah yes Anthony, I see what you have done there. One need to be cautious by using the GISP2 data: that is one point on the map that reflects the temperature on the summit of the Greenland ice core, nothing else. It may reflect more or less the whole Greenland and beyond area, but in general temperature fluctuations of Greenland and NW Europe follow opposite swings, together with changes in the NAO. A “reconstruction” that misses the Minoan Warming Period 3x longer than the claimed resolution is not in need of fine tuning, it is in need of scraping. Part of how the Marcott graph fudges history is by flattening inconvenient variation in prior centuries to falsely suggest the difference between the peak of the MWP and bottom of the LIA was only around 0.4 degrees Celsius. In contrast, a more honest source, Loehle data at http://www.drroyspencer.com/global-warming-background-articles/2000-years-of-global-temperatures/ , shows such was around 1.2 degrees Celsius difference. Every warm period in the Holocene (and before) has had more relative temperature change near the arctic than in the tropics (simply because the tropics never change much in temperature), as is so for the Modern Warm Period (“global warming”) as well as all of the others. 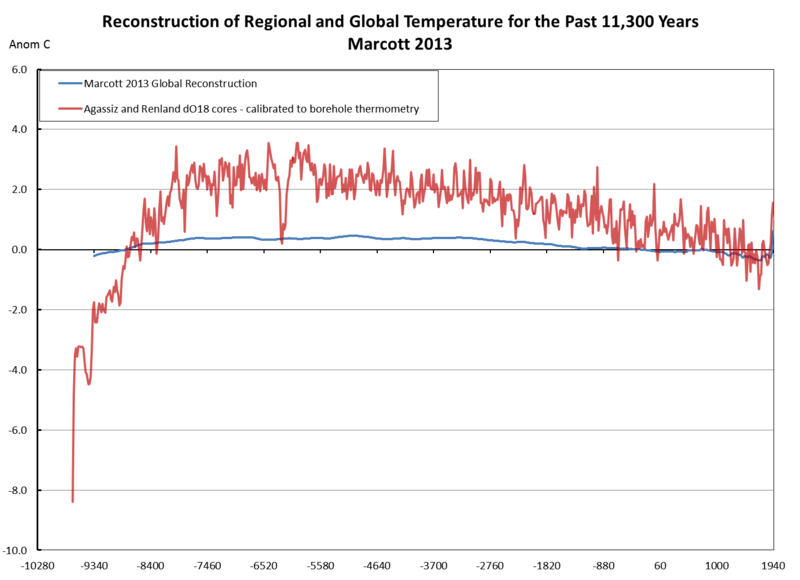 The general picture of current temperatures not being much compared to past millennia is seen both in the GISP2 data as well as illustrated in as wide reconstructions as Loehle. There are loads of other examples, including higher global sea levels than now during the Medieval Warm Period and still more so during the Holocene Climate Optimum. As another illustration, http://www.sciencedirect.com/science/article/pii/S0009254199000297 references how near-Arctic Eurasian vegetation was 20% more than now during the Holocene Climate Optimum and 55% more than now during the Eem interglacial optimum (due to those times being much warmer than now, with less frozen ground). Both hemispheres appear to correlate well. How about the person who splice indirect proxies and the measured temperature record and claim unprecedence? How about the person who thinks a heterogeneous global temperature sampling on continents, weighted with statistical methods has a climatic relevance? Ignoring processes is what the AGW crowd loves the most. No need to understand meteorology and climatic evolution, just measure and compute and tada! It’s there. The money for promoting man-made global warming hoax and global governance is going bye bye. What is actually stunning is only a 3 degree fluctuation over 10k years. That should be an immediate red flag. Thanks for not deleteing me per my hot headed request. Working on another blog just now and it jumped into my strange brain. Why not attempt to bait and switch aka trick the Democrats in the U.S. Senate to put up some CO2/Climate Change/Global Waming , big spending bill as in a tax on milage on auto/truck use and or some such tax and spend boondogle. Once it comes to the floor have Ted Cruz and or Rand Paul or some other U.S. Senator well schooled on the facts known. Have that person up and ready for a 13 to 20 hour filabuster of facts. Seems to some a nice cheap way to bypass the msm blockade. That graph is particularly illustrative of how transitions from the warm state of climate to the cold state have occurred with around 10 degrees temperature drop in GISP2 over as little as around 300 to 400 years sometimes (even if not counting at all the Younger Dryas event which included an even faster drop section, just in case it was different from the others by being influenced by a comet impact, though there seems no way that the bulk of the others could be comet impacts). That would be proportionally like every several decades or faster a magnitude of change equivalent to the difference between the Little Ice Age and now, again and again multiple times over, an extremely rapid change in climate terms, vastly beyond the comparatively tiny fraction-of-a-degree changes in modern history. That fits with what I have heard elsewhere from trustworthy sources, whereas in contrast CAGW propagandists saying any transition to an ice age could only be gradual over tens of thousands of years are just lying as usual. So today is Labo(u)r day? “Oh and here is another thing to ponder: Imagine the Holocene was warmer than they suggest. That would imply a more sensitive climate since the change in forcing between Holocene and LIA isnt particularly big.” or you just think that c02 is important when it might not be. In fact loocking at the long perspective several million years temp and c02 curves are all over the place so it cant be that co2 is as important as you think. And remember that MOST of the spike at the end was CREATED by man.. ie Hansen et al. Sorry. As soon as you flatten out the MWP to next to nothing I smell a rat. But diffusion of elements in the ice core is also postulated to “smooth” the temperature variations, so your supposition that “ice core has much better resolution” isn’t justified, Steven. The “high frequncy variation” you mention has likely been lost. 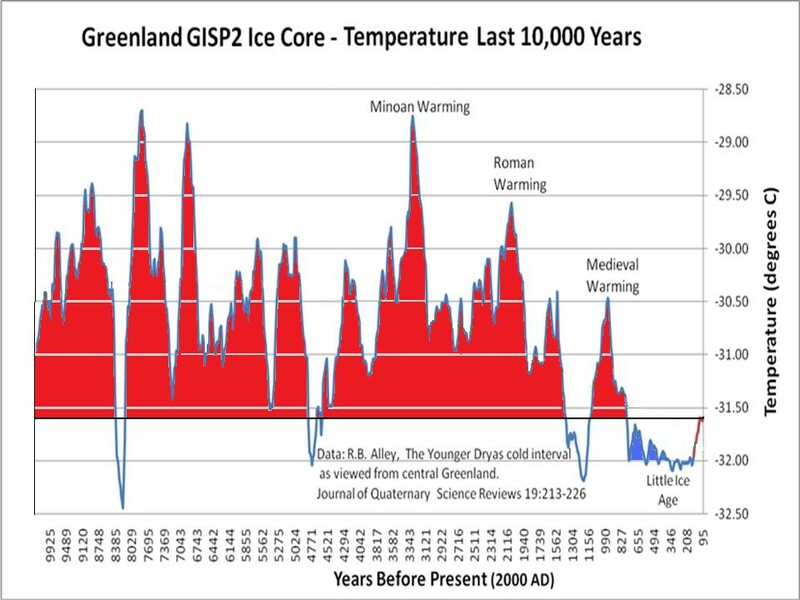 But back to the original posting, Marcott should show his temperature graph of the past 10,000 years so we can all see if it’s valid or not. To what does he compare the last 100 years (of which at least half isn’t due to much anthropogenic influence at all)? Inquiring minds want to know. What may be unprecedented, that which has certainly spiked markedly in the late 20th/early 21st Century, is culpable stupidity overlapping considerably with outright scientific deception. There is no way that this smoothed foraminifera derived proxy data of low resolution should be juxtaposed with very high resolution modern instrument data. The press are having a field day – EPIC global warming screams one particularly nauseatingly uninformed rag. Furthermore, the whole story is conflated with virtual reality IPCC computer predictions of extreme warming which, without any scientific justification, is being touted as a natural consequence of the trend shown by this ‘new’ data. And why did the study stop at 11,300 years. had they gone back further, they would have encountered the Younger Dryas which might have really screwed up their nice smooth pre-industrial revolution temp data, even at low resolution. Could have ended up with a double-ended hockey stick! So, what would it mean, if the reconstructions indicate a larger (Esper et al., 2002; Pollack and Smerdon, 2004; Moberg et al., 2005) or smaller (Jones et al., 1998; Mann et al., 1999) temperature amplitude? We suggest that the former situation, i.e. enhanced variability during pre-industrial times, would result in a redistribution of weight towards the role of natural factors in forcing temperature changes, thereby relatively devaluing the impact of anthropogenic emissions and affecting future predicted scenarios. How do you get error bars of of +/- 0.2 deg C from data with a spread of between 2 and 6 deg C? How can you justify splicing the high resolution air temp data onto an ocean reconstruction?Surely you would need to use ocean temp. The ice core has much better resolution. That means it has a better chance of picking up high frequency variation. marcotts proxies are basically “smooths”. Good point, but the Marcott analysis seems to splice instrumental records which have the highest resolution of all to those “smooth” proxies. The worse their proxies the more “unprecedented” it gets. We’ve seen this before. This is a replay of the Mannian Hokey Stick. First claim unprecedented warming for 2000 years. Next nothing to see here, move along, but we were right anyway. So which of these collaborators will republish, 20 years later, saying I found a accidental bias in my calculations, Oh look history is restored? Al la Briffa, actually I am not sure how many years it took Briffa to “correct” his work. Harrison is at Reading University in the UK. Hang on Steve, the Gisp2 total temp variation is of the order of 3 degrees C, yes? Whereas, the Marcott reconstruction is showing a total variation of less than 1 deg C. Now, that is some helluva smoothing, wouldn’t you say? Irrespective of the global vs local issues, which I accept – it does not really follow to have such high temps locally for many centuries (as per Gisp2) and not have them ‘reflected’ globally. The suspicion is certainly that the Marcott graph ‘stopped’ at 1500 years ago intentionally too! I think someone mentioned that this is a Greenland temp scale compared to a global scale… so to be fair, can we get a copy of the Marcott et al. Greenland data to compare the two to see how they look together? Not apples and oranges but apples and turnips. It is a bit off topic, for which apologies, but an aspect of the original release that jumped out at me was the “it should be getting cooler” comment based, as far as I could see, on a perturbation in Earth’s orbit that means the Northern hemisphere is getting less sunlight. I suspect that as AGW sceptics, some of you ladies and gentlemen are going to be among the world’s leading experts on the sun’s influence on climate so I was wondering whether or not you would concur with that specific element of the Marcott analysis? So, contrary to his publicity package, it is not the case that Marcott has proven that current temps are unprecedented in the last 11k years. Rather, Marcott has shown only that IF present temps continue for another hundred years THAT event would be unprecedented in past 11k years. If this study is using 100 year smoothing, how does that affect their near time data? Do they get their “Present” temperatures by smoothing with climate model projections or did they just stop smoothing an use thermometer readings directly? Or did they manipulate the neat term data some other way? The same trick of blurring many different proxies together was used in a paper posted last year focusing on the start of the Holocene (sorry no link, posting from my cell phone) which tried to blur out the Younger Dryas with the aim being to obscure and conceal the lag in the CO2 rise after the temperature rise, which is clearly resolved in individual high resolution proxies such as ice cores. How does your argument about CO2 sensitivity square with the observation over the last 7000 odd years since the Holocene optimum, that while temperature has declined, CO2 has steadily risen? Also you are contradicting your own resolution “apples and oranges” argument by accepting in Marcott et al the brazen Mann-like splicing of the modern high resolution temperature instrumental record onto the low resolution proxy blur. Looks like hiding the decline “Nature trick” to me. “What decline?” Exactly. Is anyone in the CAGW movement actually aware that excursions of higher temperature occur typically at the end of interglacials? If I understand correctly, this claim depends on understanding the the physics of all possible forcings, which would be very helpful if you actually do and could explain for us. FerdiEgb has already provided a couple of citations. I am sure SM grasps the difference between a TOA radiative forcing abstraction and the physical response of the climate system to an actual physical stimulus. Our results indicate that global mean temperature for the decade 2000–2009 (34) has not yet exceeded the warmest temperatures of the early Holocene (5000 to 10,000 yr B.P.). Sorry, I just can’t help focusing on exactly what some people say. Maybe it’s just a slip. Now for some Arctic specific warm horrors. Disclaimer: in no way does this imply that the rest of the world was in any way involved. How come the objections in this thread, and in the previous two On-Topic threads, didn’t occur to the peer reviewers? “Mainly a realignement of the weather, and the global scale response was slower”. This comment shows the disconnect between computer climatology and the observation based science: how do you think climatic shifts are expressed Mr. Director of the Climate Institute? Climatic shifts are reflected through the weather. So weather “realignment” that is variation of intensity in atmospheric circulation lower layers is at least hemispheric if not global. Peter … perhaps … but the Milankovitch cycles unfortunately don’t quite explain it all … perhaps a reason Arrhenius went looking for other forcings in the first place…. Milankovitch believed that decreased summer insolation in northern high latitudes was the dominant factor leading to glaciation, which led him to (incorrectly) deduce an approximate 41ka period for ice ages. Subsequent research has shown that the 100ka eccentricity cycle is more important, resulting in 100,000-year ice age cycles of the Quaternary glaciation over the last million years. More recent work by Berger and Loutre suggests that the current warm climate may last another 50,000 years. Tim asks to see Marcott’s Greenland data. As I said above, there’s a bunch of high-temp records with peaks around 1-3 C mixed in with a whole bunch of basically flat ‘random noise’ records. The flat records dilute the size of the peak without changing its shape – the argument is presumably that the Holocene Optimum only occurred in some places, and therefore the global average is much lower than local averages. Mann’s treering data looked similar – there were a few lumpy records and a lot of series that looked like flat random noise. In that case, they emphasised the lumpy records because they had big spikes upwards at the end, but the suspicion was that none of them were measuring temperature and the lumpy ones were simply corrupted. Whether you choose to believe that some parts of the world rose in temperature up to 3 C while others saw no change at all, or that some of the proxies are not very good thermometers is up to you. But there’s no big surprise that if you average data with a bunch of flat series then the result will flatten out. And if you sample at long intervals then any blips happening on timescales of less than a thousand years will simply not show up. The sin is splicing in the modern temperature record, and claiming that a 30-year spike is shown to be ‘unprecedented’ by comparing it with a reconstruction in which spikes shorter than 3000 years are attenuated, and those shorter than 300 years eliminated entirely. Please keep in mind that us ignorant amateurs are trying to learn from WUWT and things on the charts that are obvious to you need a little explanation. For example. -31.00 C?? Dang! It was cold during the Roman Warming period. Funny they didn’t use the famous GISP2 temperature proxy. Famous that is. You know what, only 1 of the proxies used (out of 73 of them) show anything like the 0.6C spike at the end of the chart (which is 1940). Theonly proxy which has this is Agassiz-Renland ice cores (dO18 calibrated to borehole thermometry again). So, this reminds me of the 1 tree in Briffa’s reconstruction. Here is Agassiz Renland against the main temperature stack from the paper (which appears to be the only proxy which made the 0.6C at the end ). Agassiz-Renland temperature reconstruction which appears to be the same as in the data file. But he has based it on a couple of dozen variously weighted proxies, most of which show warming. It is really worth going back to assess Mann’s original contention that the MWP was ‘cooler than the present’ (of course, he has to rename it the MCA, the Medieval Climate Anomoly, as otherwise the whole thing would fail the Orwellian test). Note Figure 2 – the top figures showing the temperature anomaly map of the world for the MCA (compared to the 1961 to 1990 period) ..and the weighted proxies on the right…to me it is an incredible construct: Note all the blue (cooler than recent times) on the map. However, most of the proxies used show warming in their immediate area!! Starting in northern America we see a cluster of proxies – by the temperature anomaly map, all apparently warmer than now, except for one cooler site. Down to the Caribbean … neutral, but heavily weighted. ALL of the Southern Ocean, the southern Indian Ocean, and southern Atlantic oceans were supposedly much cooler, (based on Tasmania, and three proxies in Africa?!!) All of the eastern Pacific is shown as cooler, … based on a string of proxies in the western Americas, which were mainly warmer, and perhaps eastern China ..which was warmer anyway? See Fig. 2. It shows reconstructed surface temperature pattern for MCA (950 to 1250 C.E.) and LIA (1400 to 1700 C.E.). Shown are the mean surface temperature anomaly and associated relative weightings of various proxy records used (indicated by size of symbols) for the low-frequency component of the reconstruction. Anomalies are defined relative to the 1961– 1990 reference period mean. Now I do appreciate the vast effort and detailed measurements and complicated science which have gone into this effort, but thinking it is related to reality to me it is rather like building an intricate model of a Boeing 747 with Lego blocks (a truly mighty effort indeed) and then selling flight tickets to London. Here’s something for Steven to ponder: If the polar jet switches from a fast polar flow to a weaker meridional flow, what is the effect at TOA? Typical modeler answer is that the polar jet is a feedback just like all other weather so can’t affect the TOA flux. Typical modelers in the early 2000’s said the Arctic polar jet would get stronger especially in winter due to the decrease in sea ice because of the increased longitudinal temperature contrasts. Sure enough the polar jet had generally strengthened through the 1990’s to match the models. A typical modeler nowadays would say that the Arctic polar jet will become more meridional due to lower latitudinal temperature contrasts and that would make the jet weaker. Sure enough the polar jet got weaker through the 2000’s to match the models. One thing to ponder is that the changes in the real world weather preceded the changes in the models. Another thing is that solar activity decreased through the 2000’s. The forcing didn’t change a lot like you say, but that’s only considering TSI which is does not affect weather very much. What is much more important is that the solar spectrum changed which caused weather changes such as lower UV connected to more blocking (e.g. Lockwood 2010). So what you consider sensitivity of the climate may actually be long term changes in weather due to long term changes in solar activity. The next decade of changes will likely clarify the issue and there is obviously no need to do anything while the global temperature rise is so small. Is there a complimentary (not behind paywall) online version of the Marcott et al 2013 paper? Annoying not having ready access. They do it for the headline. They don’t care if it is proven to be rubbish afterwards. They’ll ignore that part and assume the general public have moved on – no doubt to look at their next “shocking” headline. Funding has got to be pulled on the enviro-whackos, right across the board. It’s the only way short of violence to stop these people. What they are doing is criminal. More than that, it’s treason. I’m surprised more people don’t see that their aim is the total destruction of everything that has gotten humankind out of caves and into civilization. And we’re PAYING them for this destruction??? I say, pull the plug. Post (see below) on BH with link to standardized plot of all 73 proxies without statistical alchemy. This graphic, plus the geographical distribution of the 73 proxies (nearly all are coastal/marine locations, with large regions of both land and sea not represented), makes one want an especially thorough audit of the study methods that yield claims of such a distinctive hockey stick pattern as globally significant. Here is a graph of the last 1000 years of all the 73 proxies, (shifted to have zero mean). Can you see the spike? Note, the present is on the left in my graph. I doubt that comparing a global temperature reconstruction with part of a (flawed) drawing of temperatures high on an arctic ice sheet would have occurred to anyone else, not just the peer reviewers. The “blade” of the hockey stick is made up of a single point centered at the year 1940 (1930-1950 bin). The next point is at 1920 (1910-1930 bin) and is actually an anomaly of less the zero. The slope between these last two points is 0.35°C/decade. None of the proxies remotely resembles the final synthesized plot shown in the Marcott paper. Most have temperature ranges much larger than the final chart. 24 of the 73 proxies contain data after 1910. Only 9 proxies have more than one data point in this region, permitting a slope determination. Of these, 5 end with a negative slope (decreasing temperature), 3 have a positive slope (increasing temperature) and 1 has a zero slope. The 9 proxies contain only 33 measurements beyond 1910. The average 1910-1950 slope for the 9 proxies is 0.13°C/decade, about 1/3 the value shown in Marcott’s overall plot – and barely enough to bring the final data point back to a zero anomaly – a much less dramatic plot. Hmmm…. None of this invalidates Marcott’s conclusions. I’m not a statistician and my analysis was quite simple. I have not looked at the spatial distribution of the data. However, I think a thorough examination of the statistical methods used by Marcott might be warranted. 1. How long have thermometers, accurate to 0.5 degrees, been available? Less than 150 years? EVERYTHING before that is proxy / assumed data. 2. Is there ANY data, proxy or otherwise, that takes into account continental drift / tectonics in general? 3. Has Greenland ALWAYS been where it currently sits? 4. Has the Gulf Stream ALWAYS flowed the way it is supposed to? 5. Has Antarctica ALWAYS been where it now is and permanently covered in ice and snow? NO is the correct answer to both of those. Ditto Australia. 6. What was the “climate” when Africa and South America were actually joined together? 7. Did sunstroke kill all the wooly mammoths in Siberia? I couldn’t resist. It has been a long week. You write: “IF present temps continue” . . .
. . . but I think you mean something else. Maybe referring to the rate of increase, say from 1976 to 1998, or at the rate proposed in one of the scenarios produced by the UN IPCC. It is my understanding that at the present time (16 or so recent years) the global average temperature is not rising. Other than that, I had the same thought you have expressed. Sorry but the graphs overlaid as such in nonsense. in order to generate ‘hysteria’ among the general public. picked set of 73 locations, is nonsense. longer about Geophysics at all). 1. The validity of the ‘proxies’ used in the new study. 2. The global coverage of those proxies. 3. Whether Greenland data matches world data, assuming the proxies used for that to be accurate? What can, however, be seen, from the Greenland data is that a 1.5 – 2.0C rise in rapid time can occur, followed by an equally rapid descent some years later. The caterwauling alarmists never seem to discuss that, do they? Boring, Watts you compare apple with pears. If you take GIPS2 you have to compare not Globally, you have to look @ 30N-90N-Stack of this Studie. You looked there, you can see the actual temperature of 30N-90N is nearly 1K lower that Holocene-Max. Its like I said, this is from Oregon State University. So the more you look, the more of this you will find. So basically marcott has data points once every 150 years and them compares a temperature record of 100 years to this? Anyone else see the issue there? It is physically impossible to do that. The entire statement of unprecedented warming is just retarded. Has anyone else noticed that in the plots where Mann 2008 is overlaid on the new reconstruction, the high-frequency noise in the line jumps up exactly at the start of the overlay? Could Mann 08 have been the actual ‘secret ingredient’ in the proxy roster that creates the end-spike? That’s pure speculation – I don’t know. Perhaps someone with access to the paywalled part could see if it’s mentioned? Same playing with error bars? check. Same manipulation of recent record? check. If you divide the daily sunspot numbers by 90 and then subtract it from the CET daily maximum, the period from 1897 to 1997 has a flat trendline. Or you can divide the yearly total by 32000 and subtract it from the yearly maximum temperature for the same result. It pains me to see how you overlay plots incorrectly. Ugh. 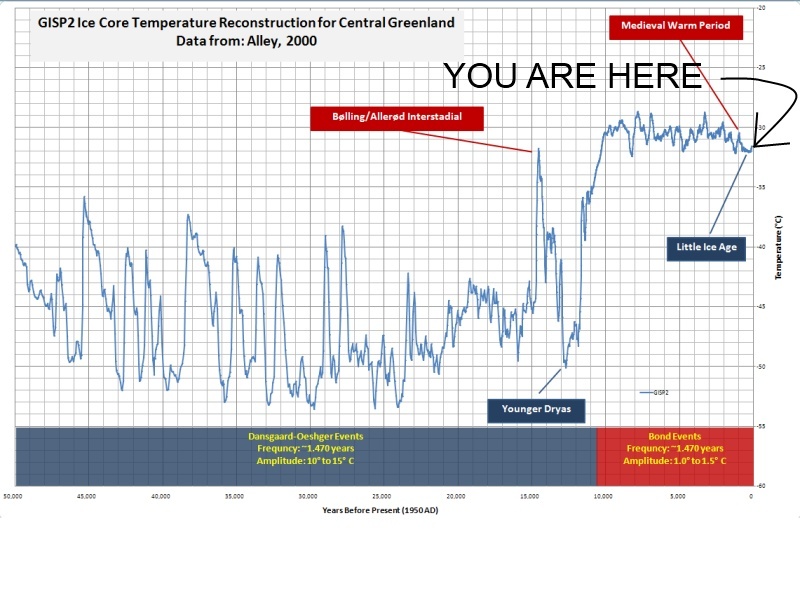 You are comparing regional (greenland temps) to a global average temperature reconstruction. This is inherently wrong. You should explicitly explain this to your devoted fans who may think what you’ve done is correct. If, say, we had a bunch of publications discussing temperatures in Chicago vs. Florida vs. global averages. Each was by a different author. Would it be accurate to compare all of the temperatures and then say the author’s must be lying because see how they disagree. @youarewrongagain, using many proxies means that there are a lot of data that will cancel out each other. That is why GISP2 data are moving so wild compared to the bundle of datasets of the underlying study. Adding a pike of measured temperatures at the end is the finishing touch for another hockeystick. Nullius in Verba, you are right. @ Bruce, spreading at the mid Atlantic ridge is about 4cm/y, so you can calculate that for the period of let’s say the last glaciation that ended 12,000 years ago, Greenland must have shifted longitudinally by 240m from the ridge center during this period. As for Australia, Antarctica, even if the East Pacific Ridge spreading is faster around 15cm/y, here again the change of respective positions during the period would be negligible. Yes, and that’s exactly the sort of comparison that should be made in order to understand what is going on. People are aware of certain previous reports about the Holocene Optimum, when new information comes along that appears inconsistent with it, you investigate. First you isolate the point of apparent conflict. You check the data. You check the sources. You find out exactly what it means, how it was processed, what it assumes, what its error bars look like, you find out how they were calculated, you consider other data sets, other hypotheses, and you keep digging until you get a satisfactory explanation. That might result in discovering a flaw in the new information, or you might discover a flaw in your old information, or you might find out that you had previously misunderstood one or both and the appearance of a conflict is expalinable. Any way it goes, you make progress. As you say, a global average is not the same as a local average. But the fact that the two can be so different implies that the behaviour is not uniform globally, which is an interesting new fact you have learnt. It reminds you that global averages don’t tell you anything about local climate changes, which is where people directly experience it. It opens up new questions, like where did the warming occur, and how can you get drastic warming in one place and none at all in another, and are the proxies really reporting temperature reliably, and what does the averaging process do to the fine details, and what does it mean for all the high-frequency details to be lost, and is it valid to mix data with different frequency behaviours in different parts of the record? As a result of asking such questions, we now know that many of the assembled proxies don’t show any temperature change over the Holocene, that if these are accurate that the global average was smaller than the local effects in many places, that the up-tick at the end appears to be some sort of illegitimate splice of modern Mannean data that doesn’t appear in any of the 73 proxies. It isn’t a confirmation of Mann’s hockeystick if it includes Mann’s hockeystick as an input. It isn’t a confirmation that either the size or speed of the modern peak is unprecedented if any such spikes and peaks would be smoothed out. It isn’t evidence that local climate changes – the sort people will actually experience – are or will be unprecedented when global is so different to local. But it is quite true, as we’ve said several times now, that the disagreement of the average with the individual contributors like Greenland isn’t an inconsistency or error – not that Anthony said anywhere that it was; in fact he cautioned against jumping to conclusions. Now see if you can find any of those media sources who said this showed global warming is unprecedented in 11,300 years acknowledging any of their errors. See the non-empirical hockey stick graph at Stockwell’s article linked above….. it’s a statistical artifact, like the fundamental uber-graphic for all hockey sticks of certain methodologies…. Stockwell says it’s basically encoded into the statistical treatment of proxies (unless presumably better care is taken to avoid biasing the results). And then, there’s the large, unshielded, somewhat erratic, fusion reactor around which the planet appears to orbit. No, Bruce, that fusion reactor is extremely stable. On the one hand we have statements by the foremost Scientific Organizations in the World, including the AAAS, the NAS, American Meteorological Society and the American GeoPhysical Union that the evidence for Anthropogenic Climate Change is compelling and that there is a scientific consensus; in this forum we have many strong statements claiming it’s bunk. A Science article reports 13950 peer-reviewed articles support the Scientific consensus, 0.17% raise some question about it’s validity. It doesn’t seem the deniers have science on their side. The IPCC is a political organization not a scientific organization and their job is to sell MMGW to The World. The problems started with Michael Mann’s “Hockeystick” Graph which is sheer rubbish but because it threatened a disaster the newspapers rubbed theirs hands with glee and duly kicked of the Mannmade Global Warming scam. Don’t underestimate the effect of a media campaign. We are still recovering from the Little Ice Age and the temperature has been going up steadily for approx 200 years (and could continue for some years more). However, that does not mean we should carry on as if nothing is happening. The World will to run out of fossil fuels and all avenues should be explored to find alternatives. I strongly object to is the way that the IPCC campaign is distorting research funds so that anyone wanting to research a subject that might go against MMGW will be denied grants, and causing millions of dollars to be wasted on Carbon Credit schemes. Zctek, are the AAS, NAS, American Meteorological society, and American Geophysical Society all political as well? Is the peer review process that’s yielded 99.8% of 13,950 papers affirming Anthropogenic Climate Change also political? By your standard, we can’t count on relativity, evolution, or in fact, any of today’s Science. 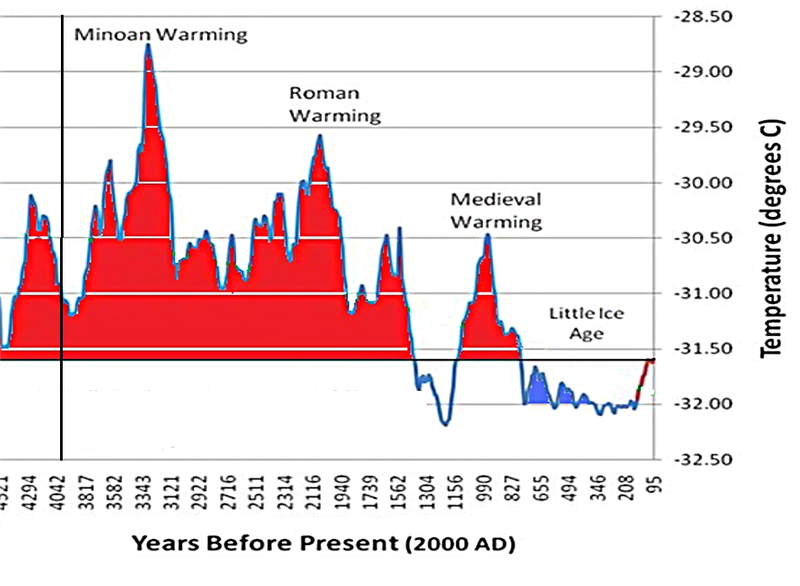 Warren, Do you believe that Michael Mann’s “Hockey Stick” is a true representation of the last 2,500 years of temperature/climate? That is the lynch-pin of the IPCC’s policy. There is a mixture of good and bad science. It is what the IPCC chooses and does with it that’s wrong. Thanks for your reply. I am an Engineer, not a PhD Climate Scientist or Physicist, and wouldn’t attempt to answer your question authoritatively. I don’t agree one can judge the validity of ACC (Anthropogenic Climate Change) by looking at the political nature of the IPCC. It is of course political, as are most large bureaucracies. But that doesn’t mean it’s wrong on the Science. I am looking instead to statements issued by World premier Scientific Societies, calling the IPCC conclusions “compelling”, and the 10s of thousands of Peer Reviewed papers supporting ACC vs the couple of dozen according to an article in Science, that question ACC. To moderate my earlier comment, all I suggest is skeptics publish to establish Scientific credibility for their case. Since there are so few “anti ACC” peer -reviewed papers around, it makes one wonder about the strength of their case. @Bill Illis- I found a couple more. After a good kick in the pants last nite to not assume just because everyone else was saying it, I dug in. To the extent that I could within my limited expertise, I started picking things apart. First I tried to find a description of where the data for the “blade” came from. I learned “BP” was 1950 as many correctly commented. I manually identified by reading each data set there are only a handful of the data sets that cover the period after approx. 1900. In skimming these data sets temp records for the 1900 and onward period, where the “blade” shows up, nothing jumped out at me. I learned Marcott’s graphs showed their “Temperature Stacks” data. While some of the details are over my head ( like how they calculated the numbers) I have a rough idea of what they were talking about. As I looked at the “Global (°C)” data for the appx 1900 onward period the “blade” started to become clear. There are a handful of the data sets with large changes upward from appx 50 yrs BP (1900) to 10yrs BP (1940). I graphed in Excel each of the temperature stack data sets and there are a number of blades shown. So the blade is clearly there the last 50-70 years or so before 1950 using the authors temperature stack data. How they computed that data is over my head. One of the stats guys will need to look at that. I wasn’t ready to give up so I went back thru the records that included data for the 1900 and later period. There were roughly 25 data sets that covered some time period after 1900 or so. About 8 jumped right from 1950 back 200 or more years for their next measurement – it appeared to me these offered essentially no relevant “blade” data – as you can’t calculate the increase for the 1900 onward period, even though they report a 1950 or so data point. 7 more had decreasing temps during the time period – although generally relatively small. 6 had smaller temp increases – from 0.08 to 0.31C during the time period. One – Vostok Ice – has no data for the first 6 periods going back to 150 years BP and thus no useful information re: the blade.. These are the only 3 data records out of 73 with a large “blade” during the 1900 and later period. “Standard5x5Grid”; “Standard”; “Jack30”; “Jack50”	… only the Jack 30 and Jack 50 show the +0.6 blade. A blade also appears with the “Standard30x30Grid” and “Standard10-lat” but it begins its rise about 300 years BP. All of these sets track fairly uniformly until appx 370 yrs BP. Someone with stats knowledge and an idea of how they created the temp stack data sets will have to decipher what that means – but the “blade” data is there if you plot the data. The Agassiz-Renland data shown in the Marcott data tab is already the 20 year average temperature deviation. Warren, Thanks for replying. Like you I have an engineering background in computer development, but I also have an interest in most of the sciences. The reason theat I am became very sceptical about AGW is because the original “Hockey Stick” managed to get rid of the all the variations before the Little IceAge. 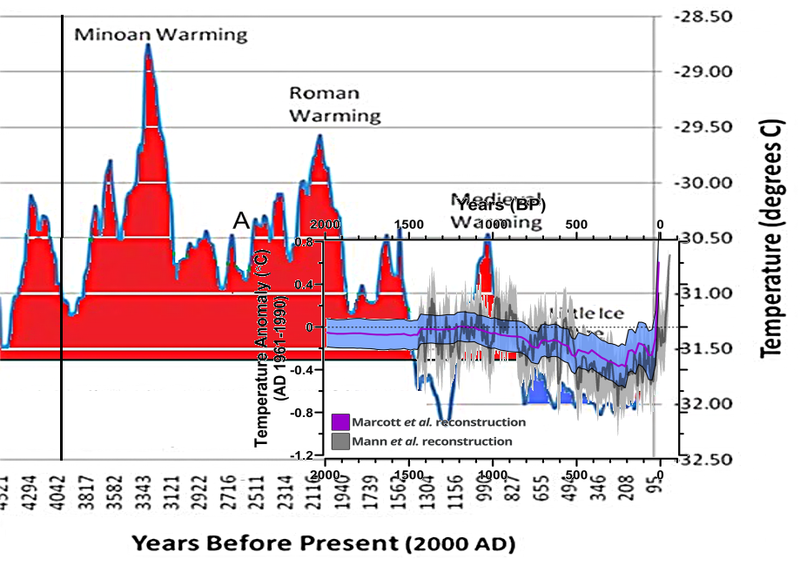 The “Hockey Stick” used an algorithm developed by Michael Mann and he claims that his method used proprietary information the he refuses to disclose. Not the way for a scientist to behave! Zcetek: Thus you seem justified in asking if this is bad science. If it passed the peer review process, it might be useful to see if his Peers raised questions about his statistical methods, and if he answered. Maybe there’s a way to search online for the authors response to this issue. Worth a try perhaps. …information that he refuses to disclose. statisticians slam random global warming hockey stick graph. No need to justify study results trumpeted by the media so long as you say they are “not robust” — so remind me of why his article was published in SCIENCE to get all this media hype over results which are “not robust”?? YouAreWrongAgain. Greenland, Antarctica, and the Arctic all show strong correlation, proving that temperature changes were global in extent. Thanks to A. Scott for some fascinating insights. In phase, perhaps, but not in amplitude. A cautionary demonstration of the problems of comparing in one one location with another (or global temperature) to make implication about global behaviour. This is the problem with comparing GISP wityh global data – GISP, being localised, is going to show much more variance. Warm periods will be warmer, cool periods cooler (see MWP and LIA for that). Long-term temperature changes in the North Pole are larger than global, too, as we can see in any data set in recent times (eg, UAH – 3 times as much warming as global, same for the geological record). Not to mention that the GISP graph up top only goes to 1889, and the Marcott graph to 1950. Apples and oranges in several ways. From what I’ve read, Marcott says current temperatures are warmer than most of the last 2000 years, that what is unprecedented is the rate of change, and that yes, he says that if temps continue to rise they will be warmer than any in the last 11,300 years by 2100. Do you have a cite to corroborate your interpretation (I’m genuinely curious)? Global climate rebounds like a piece of elastic? There is some fixed neutral state around which it oscillates?